I know that the title of this post can be a little controversial, trivial, or for some, just simply inappropriate. But, before you close this page in fear of boredom or outrage, allow me deny all these speculations. The main and pure purpose of this post is to talk about food, and strictly speaking, about how to make the best scramble eggs in the world. However, before I get to the point. I guess it is only fair to give the eggs the intro they deserve. It’s like with great big superstars – before they sing in concert, they always arrive late and of course, there is always someone less popular performing before them. Let’s stick to this strategy in order to prepare you for the big entrance of the EGGS. On Friday, Bubbel announced he needed to fly to Argentina. I sort of knew that this trip may need to happen. But, deep down inside, I was thinking: “hey, it is St.Nicolaus Day on Thursday. Surely Nicolaus will not do this to us and will make universe change plans”. Wishful thinking. So it is what it is. I needed to face the reality and come to terms with the fact, that there would be no presents in my shoe in the morning on 6th December. I was a bit under the weather all evening, I could not sleep at night and at 6am in the morning, my eyes were the size of 1 pound coin and sleeping was just a faraway dream. So very quietly (as quietly as a Hobbit feet person can) I left the bedroom and decided I would try to somehow organize my desperate morning. I made a list of presents: those already purchased and those which I still needed to get. And naturally, this has reminded me of this depressing scenario of an empty shoe. So, I thought: “why don’t I just surprise Bubbel, pack the present today and leave it in his boot this morning”. My spontaneous stroke of genius was very quickly overshadowed by my inner traditional self. 6th December is 6th December. I will put his shoe out on Thursday and he will just check it, when he comes back. So, this was exactly what I agreed with myself and I was going to stick with this. 09:15am, 3 hours into surfing through amazon, researching for gifts, I was done. I could not wait anymore and I went back to the bedroom to wake Bubbel up. It turns out, he was “just about to come to me”. True or not, seeing my starved from lack of food face, he had to get up and feed me. I don’t know if you also have it, but during the week, I can get away with hardly eating breakfast. 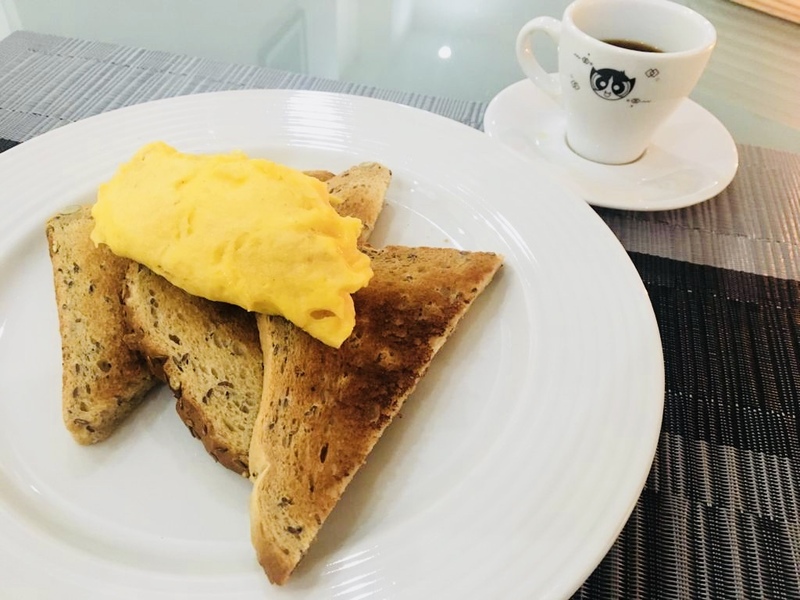 But during the weekend, when my body starts to realize what’s coming, when I think of this freshly made coffee, of the scrambled eggs on toast, I just cannot help myself. I get impatient. So, we are going to the kitchen, I order my breakfast on the app (I will explain another time, stay tuned!). And then, all of the sudden, Bubbel comes up with “Hey, how about we do Nikolaus today”? 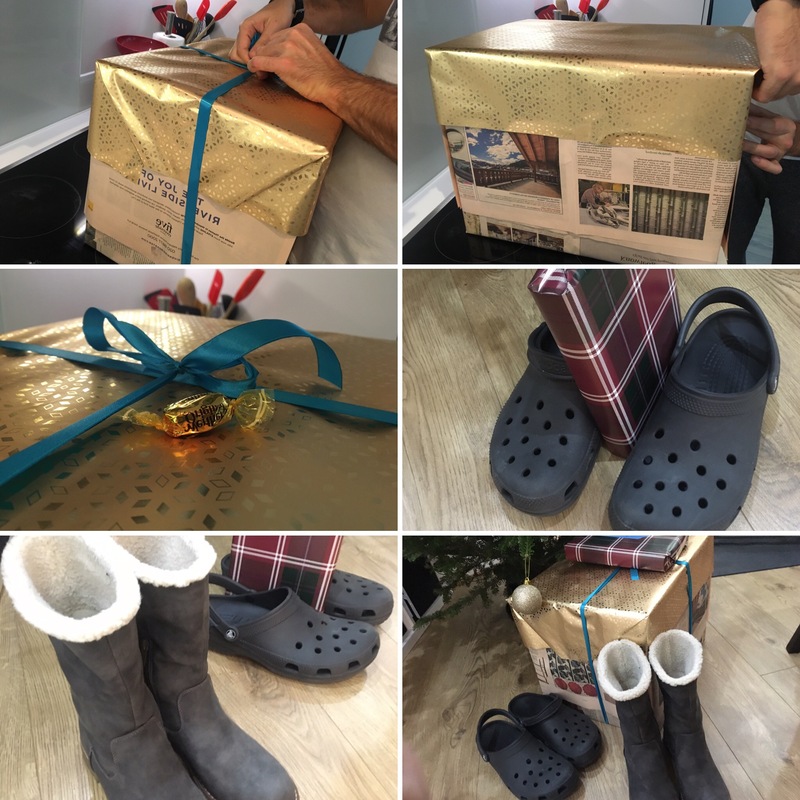 (I need to explain, that Nikolaus, is the German version of the guy who comes to us on 6th December, and leaves gifts in our shoes – very cool bloke). So, I was fighting and fighting with myself. The traditional me was trying to desperately whisper something in my ear but it finally needed to surrender as I just knew, I would go for it! And this is where a very unromantic and spontaneous part starts. Bubbel in the kitchen, me in the bedroom, we are wrapping each other’s presents. I need to tell you about Bubbel’s cool emergency packing idea. He basically uses newspaper. It always works. He mixes remaining wrapping paper with newspaper, wraps up, adds a little lolly or a sweet on the top and it always ends up looking creative and cool. 2. Beat the eggs together with a fork or a tiny little whisk. Once they are ready, add a dash of milk (it can be any type of milk you like) and a small amount of salt, up to your taste. 5. IMPORTANT: make sure you wait for the butter and olive oil to become one. Give them a moment of spontaneous pan dance. Then put your hand over the pan in a safe distance, to check the heat. If you can feel it from approximately 10 centimeters, it is ready to meet the eggs (in other words, the pan needs to be at least 170C hot, how to really test it – no one knows. Apparently, it comes with experience). Pour eggs into the pan. 6. 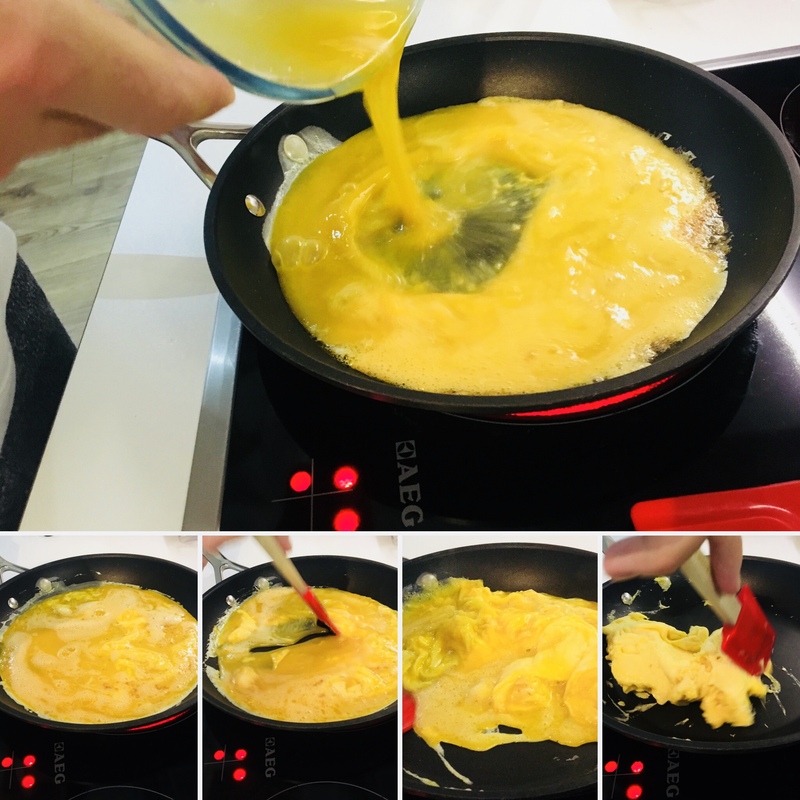 IMPORTANT 2: you need to remember to continuously steer the eggs with a wooden spoon or spatula in one direction: start from the middle of the pan and, when the eggs go to the edges, push them back in to the centre of the pan. And keep on going like this. It seems like an endless story but believe me, there is a light at the end of the tunnel. Keep on steering until you can see the eggs changing the texture. Then reduce the heat. 7. Your eggs should be ready after a very short while. They should look silky and slightly runny, almost like a yellow cloudy blanket. You can remove them from the heat as they will continue cooking for a while anyway. 8. Yes, we DID NOT forget the pepper. We add it at the end purposely, as it looks prettier and also lets the flavours nicely sink into the warm eggs, rather than make them bitter if you add it at the start. DID YOU KNOW THAT PEPPER CAN GET BITTER? I, for example, had no idea! Always remember that eggs meant to be fried, not bathed in the butter and oil. It sounds simple but believe me, some (not pointing fingers please) used to make the eggs disappear in the see of melted oil! So, we make sure that a) we don’t cover the pan with oil and butter, we just delicately smudge it with it. The ratio between eggs and pan size is important. In Bubble’s words: the eggs need the space to breath. 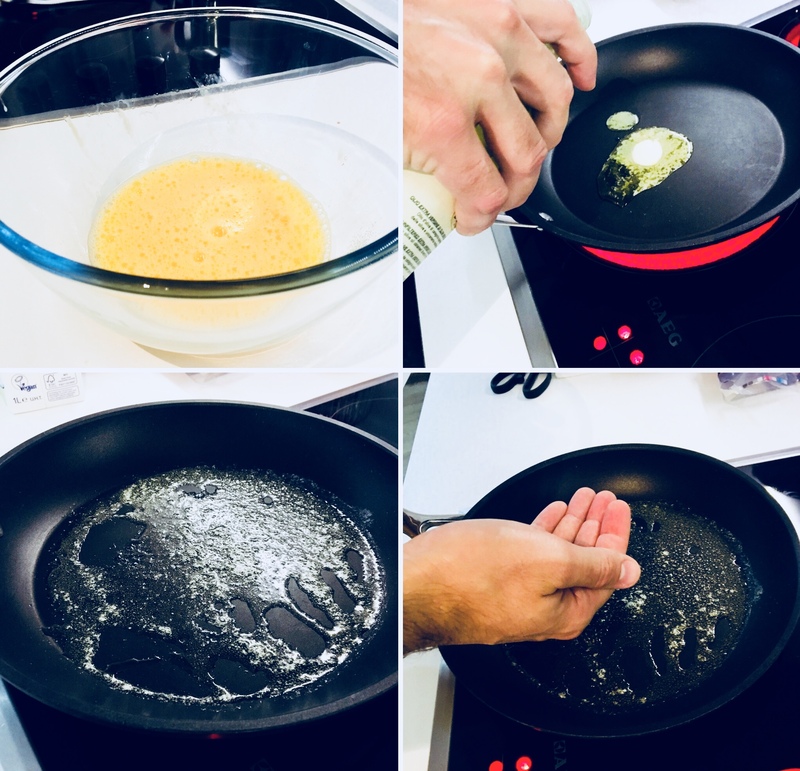 So, for 2x eggs you can use a small size pan, but 4 needs a bigger one, b) we allow oil and butter to dance in the pan for a while until hot and c) we ALWAYS push the eggs from the centre towards the edges of the pan. When they reach the edges, we guide them carefully back to the centre. The end result is going to blow you away with simplicity but tastefulness. You will be looking at your plate with admiration and you will have an inner fight about eating it now (because it looks so good) and not eating it at all (because you want it to last forever). After this yet another very educational show from Bubbel, we are finally sitting at the table and enjoying our breakfast. And then of course I realise, that he very successfully distracted me from what was the highlight of the morning – Nikolaus! Do you want to know what I got? Even if you don’t, I am still going to tell you anyway. I know, I am a bad girl today. First, I tell you the post is about scrambled eggs and it takes me ages to actually get to the point. And now, I act as if your opinion does not matter and I make you suffer and read about my presents, whereas you still have almost 5 days to wait for yours. I suggest our spontaneous solution if you struggle with waiting. So, I got a bread maker. A real master of quick and easy way to fill your room up with a smell of freshly baked, fluffy and tasty bread. A smell of HOME. We are currently at a stage of testing the little fellow, but don’t you worry our Bellies, we will be sure to share a full report once we have mastered (or not) the baking ways soon. And for now, that’s it. We are off and wising you and egg-cellent day!